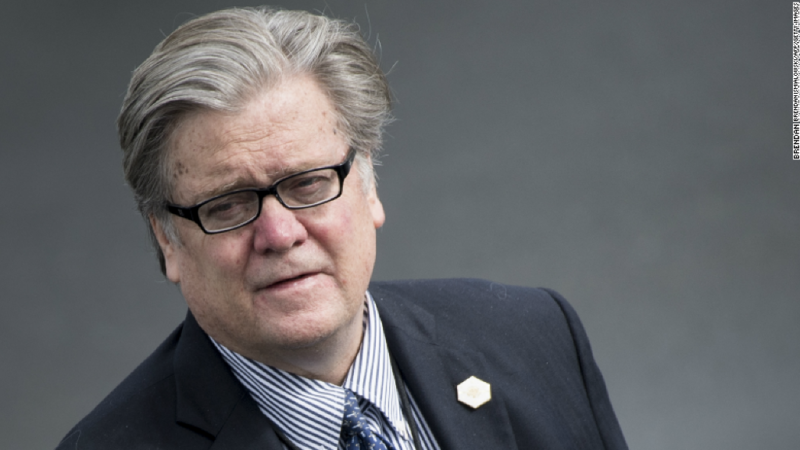 Steve Bannon's future as executive chairman of the far-right website Breitbart has been thrown into question after excerpts published from a forthcoming book quoted Bannon making a number of incendiary comments about President Trump and his administration. A person familiar with the matter told CNN that there has been a "hard push" to convince Breitbart CEO Larry Solov and Susie Breitbart, the widow of website founder Andrew Breitbart, to fire Bannon. Indeed, The Wall Street Journal reported on Thursday that Breitbart's board members were debating whether or not to oust Bannon, and on Thursday afternoon Rebekah Mercer, the conservative mega-donor who owns a stake in Breitbart, publicly rebuked Bannon in a rare public statement. "I support President Trump and the platform upon which he was elected," Mercer said in the statement, which was provided to The Washington Post. "My family and I have not communicated with Steve Bannon in many months and have provided no financial support to his political agenda, nor do we support his recent actions and statements." The New York Times reported the Mercers had even gone so far as to cut off funding for Bannon's private security detail. Inside Breitbart staffers were left in the dark, people familiar with internal deliberations told CNN. "Internally, we've been told nothing," one staffer told CNN. "Everything most in the company know about Steve Bannon's situation is coming from press accounts." The pressure for Breitbart to sever ties with Bannon increased dramatically on Thursday. White House press secretary Sarah Sanders was asked whether Breitbart should "part ways" with Bannon, to which she said, "I certainly think that is something they should look at and consider." Earlier in the day, conservative news heavyweight Matt Drudge, who worked with Andrew Breitbart for years and who has taken shots at Bannon before, tweeted that Solov and Susie Breitbart "will take Breitbart into the fresh future." His website also linked to a story speculating about whether Bannon would survive, asking in his headline, "BREITBART SHAKE-UP?" Bannon also drew criticism from Rush Limbaugh, who said on his radio show Thursday that Bannon was "the big leaker" during his time in the White House. "When you've lost Drudge and you've lost Rush," said Larry O'Connor, a former Breitbart editor and friend of Andrew Breitbart's, "how do you run the website bearing Andrew Breitbart's name?" Neither Bannon or a spokesperson for Breitbart provided comment about his future at Breitbart. The Breitbart spokesperson, who doubles as a Bannon spokesperson, also did not respond to requests for comment about whether funding for Bannon's private security detail had been cut off or whether Breitbart staffers had been left in the dark about Bannon's future at the company. Bannon joined Trump's presidential campaign as its CEO in summer 2016, and then served as the White House's chief strategist until leaving in August of last year and returning to Breitbart. He drew the ire of the White House and his other allies this week when The Guardian revealed that author Michael Wolff quoted him in his book "Fire and Fury" as saying the Trump Tower meeting involving Donald Trump Jr., Jared Kushner, and a Russian lawyer during the 2016 campaign was "unpatriotic" and perhaps "treasonous." Trump responded by slamming Bannon in a fiery statement, saying Bannon had "lost his mind." Before Trump released his Wednesday statement, Bannon was almost finished crafting his own statement with his close advisers, a person familiar with the matter told CNN. In fact, Bannon was just "minutes away" from releasing the statement that would have, in part, said some of his comments were taken out of context. But, as The Hill first reported, that plan was abandoned when Trump released his statement and it became clear Bannon's planned effort would not be enough to salvage his relationship with the president. Bannon instead avoided commenting at length on his feud with Trump, only praising his former boss as a "great man" on Breitbart radio and saying he still supports the Trump agenda.